We love seaside fashion in our house. Our kids have worn a lot of Joules over the years, which has a lovely British seaside feel – designed more for 17 degrees and cloudy than baking hot sun. I always smile at this photo taken four years ago. 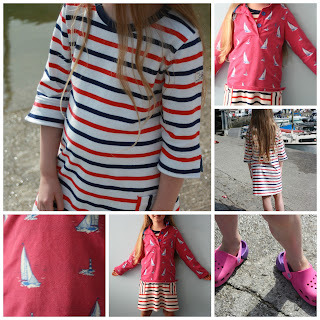 We arrived in Padstow at 8.30am, after setting off from home at 5am and headed straight into Seasalt and Joules, where we picked up a couple of things for the kids – and they put them straight on. Within an hour of arriving in Padstow, my kids were transformed from town kids to seaside kids. Although my boys have grown out of Joules now, my daughter still wears some of their seaside styles. And where better to wear them than Padstow? 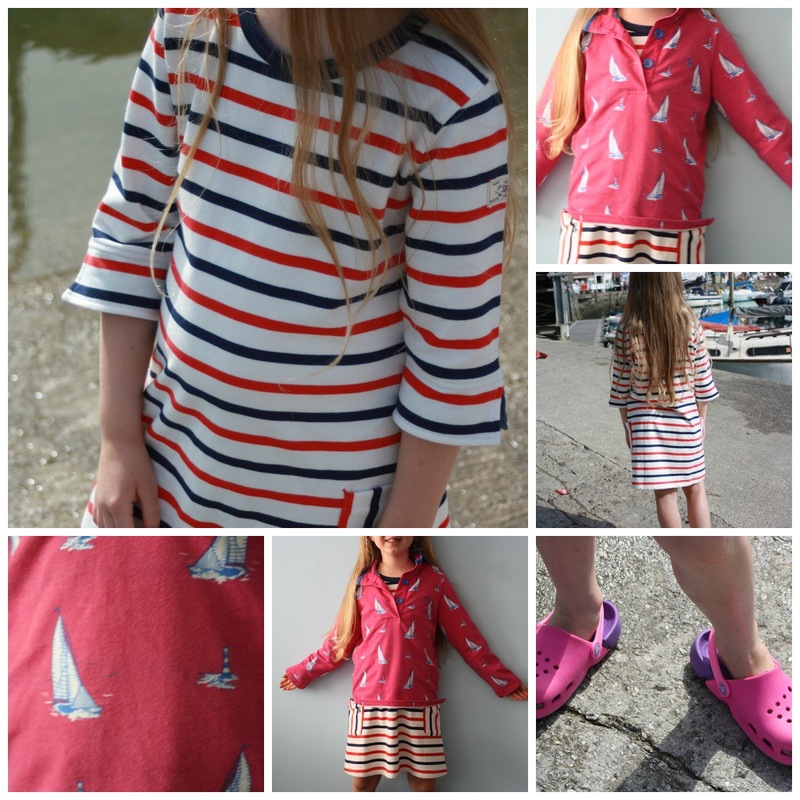 I bought this nautical striped dress and pink boat design jumper in the Joules sale this year and they both look fabulous – worn together or separately. 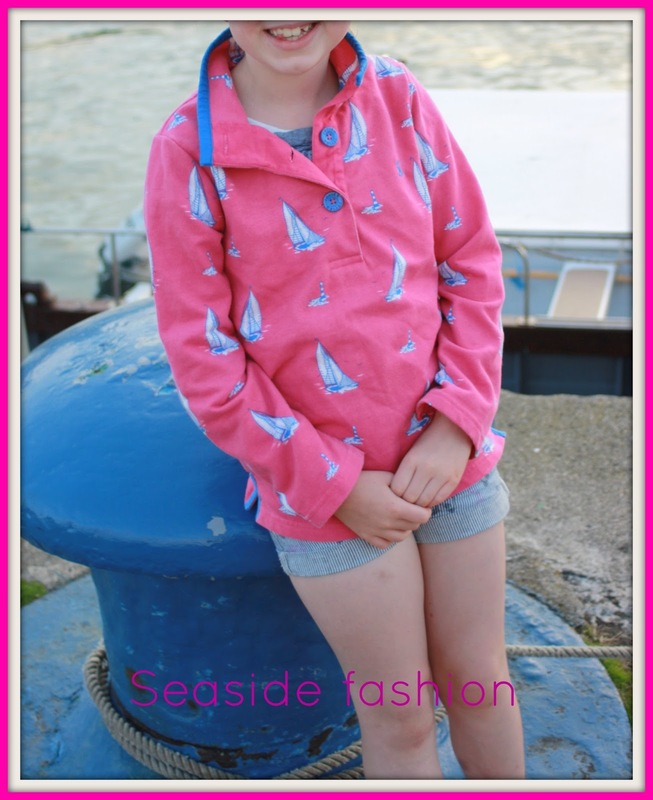 The pink jumper is great with all the shorts she loves wearing. And only a little girl could get away with teaming a pink jumper with a boat design with a cream, blue and red striped dress. My daughter is very funny about uncomfortable clothing – she will find things the rest of us find perfectly acceptable uncomfortable. I am forever having to cut labels out of clothes or wash them before she wears them as they are uncomfortable. So she was very pleased with this dress! She said it felt like her pyjamas, which in my daughter’s book is as good as it gets! She liked it so much that she wore it on consecutive days in Pasdstow (despite the wardrobe full of other clothes). Remarkably it survived the potential problems caused by chocolate ice cream on a cream dress. The seaside look is finished off with her new bright pink Crocs. Thanks very much 🙂 She is a very stylish little lady. I love Joules – not so much for me as the cut’s not quite right on me (at the moment, until I lose my weight), but love the kids stuff. I’m the same, Emma. I don’t wear it myself (it fits, it’s just not my style), but I love it for the kids.